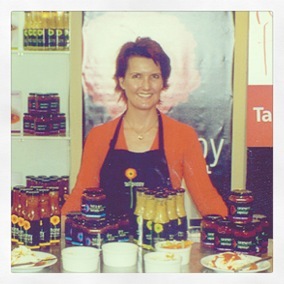 Tall Poppy Gourmet is the work of Virginia Enzerink from Cowra – Central Western New South Wales. The business began in 2002 with just one product, made in the home kitchen in Narrabri (in the North West of New South Wales). With a love of fine food and a talent for creating new and interesting flavours, what began as a hobby soon became a thriving commercial enterprise. In 2005 the business relocated to Cowra, which is an area well known for its fine food and wine. Tall Poppy Gourmet is proud of its regional presence and supports local farmers, markets and events. The Tall Poppy range has been extended to eleven products. Each is still handmade with only the freshest and finest local ingredients. They do not contain any artificial colours, flavours, preservatives or fillers and are unique in flavour, quality and taste. Packaged beautifully, they appeal to the gourmet entertainer and chef, and are ideal for the gourmet gift market. The name of the range stems from its first product, the Poppy Seed Salad Dressing. “We believe that name is synonymous with the high quality and appeal of all our tall poppy gourmet products”. They are distinct, unique and stand tall in the international gourmet market place. Tall Poppy Gourmet customers include individuals, retail outlets, cafes and catering companies. 100% Australian owned and made. Cooked with the finest and freshest local ingredients. All products are Gluten Free. Made with all natural ingredients, no artificial colours, flavours or preservatives. Cooked in small batches to retain that home cooked quality and flavour. Part of the range uses Australian native produce such as the ‘wild lime' (‘Australian bush lime’ or ‘Australian desert lime’), which grow wild in the Australian desert and the ‘macadamia', a tree, native to the east coast of Australia. Unique recipes and fresh flavours.